Harry Stapley pulled off a crucial penalty save to keep Westfield ahead. Westfield's footballers preserved their season-long unbeaten home record with a 2-0 win over Montpelier Villa on Saturday. A goal in either half from Callum Smith and Jake Adams, plus a Harry Stapley penalty save, brought Westfield to the midway point of their Macron Store Southern Combination Football League Division Two programme with a victory. Callum Smith's first half strike took his tally for the season to 25 in all competitions. 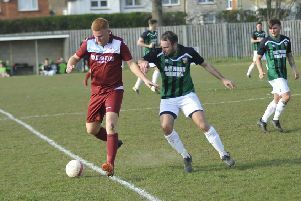 Westfield manager Jack Stapley said: “It was a good performance and a good result to go with it. Westfield opened the scoring when a good move involving impressive 16-year-old Josh Barrett, Adams and Liam Ward ended with Sam Ellis crossing for hot shot Smith to score his 25th goal of the campaign. Harry Stapley pulled off a tremendous penalty save on the stroke of half time to preserve the lead. Westfield were in control without being spectacular in the second half and Adams made it 2-0 by heading Ian May’s cross into the top corner. Westfield: H. Stapley; Harris, McGuigan, Dicken, Durrant (May); Ward, Winter, Adams; Barrett, Ellis (Dadswell), Smith. Westfield will contest a third versus fourth battle on Boxing Day (Monday). The Westies will travel to Jarvis Brook knowing a win will take them above their opponents in Macron Store Southern Combination Football League Division Two. Sam Winter is unavailable and Asher Grindle suspended, but Westfield hope to include recent recruit Allan McMinigal.